A short-lived operator at Gatwick, Hong Kong Airlines, has become the latest operator of the Airbus A350 XWB, the 15th carrier in total. The battle for passengers between Belfast and Dublin international airports moves up a gear from today (11 September) as the Northern Ireland facility embarks on phase two of a major advertising campaign to lure business away from the south. It has been in production since 1985 and with 1,280 built is arguably Britain’s most successful airliner. Delta has become the first US airline to offer video chat with its reservations team. The pilot project gives customers another channel of choice to connect with Delta for assistance. Jorge Chavez International Airport (LAP), the airport of Peru’s capital, is to be expanded significantly. 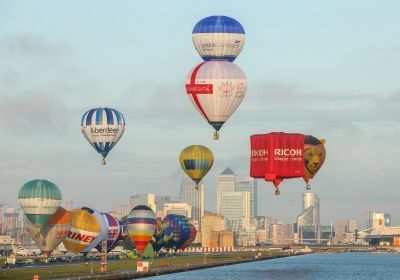 At 07:00 yesterday (Sunday 10 September), 27 hot air balloons lifted off from London City Airport as part of the 2017 Ricoh Lord Mayor’s Hot Air Balloon Regatta. It is the first time the regatta has launched from London City Airport, this year forming part of the 30th birthday celebrations for the airport. The balloons remained airborne above London for more than 1hr, travelling north-eastwards from the airport in the London Borough of Newham at around 1,000ft over Dagenham, Hornchurch and Upminster, before dispersing and landing. The festivity is just one of the events leading up to the anniversary which actually takes place 26 October. Next week we will be detailing “30 Years Serving the Capital” by Business Travel News editor-in-chief Malcolm Ginsberg. Much to the misgiving of Michael O’Leary (see last week’s BTN COMMENT EXTRA) and his claims of a “stitch-up”, the European Commission has backed the German government’s €150m loan to Air Berlin. Following the government decision that Heathrow is the preferred site for expanded airline operations in south-east England, more than 120 sites from across Britain have applied to help to build the development. Goldcar, the major European mainland car rental operator, has launched ‘Click'n Go’, a digital system for hiring and returning keyless cars. Users can pick up their rental vehicles by just using their mobile phones. There used to be a time when Michael O’Leary would find (welcoming) airports keen to attract Ryanair which he would then rename. What is the world’s longest running production passenger aircraft? The first of El Al’s 16 Boeing B787 Dreamliners will showcase tomorrow (Tuesday 12 September) at Heathrow as it makes its debut on the carrier’s Tel Aviv service. VIP visitors will gain access via the airline’s new King David suite in Terminal 4. The International Transport Forum (ITF) at the OECD (Organisation for Economic Co-operation and Development) has a new secretary-general, Dr Young Tae Kim, a Korean national. He is the first non-European to lead the global body. The single engine Pilatus Porter PC-6 is to cease manufacture having been produced in Stans (Switzerland) without interruption since 1959. With a maximum of 10 passengers, and normally a pilot flying solo, the aircraft has performed in a variety of roles, in scheduled services, utility work and for the military. From 1 November Ryanair will change its boarding rules regarding luggage. The hold allowance will go up from 15kg to 20kg, the industry standard (although many follow the IATA recommended 23kg), with the current hand carry-on bags service modified. The Jeremy West Hollywood hotel, the newest offering on the Sunset Strip, has welcomed its first guests. The Tallinn tram system has finally arrived at the Estonia capital’s international airport. The ride to the city centre is 17min and the cost is €2 each way. It has been a long time coming but Virgin Atlantic has joined the wi-fi club, certainly the first British airline. Just over 10 miles from Gatwick, and in the middle of the small market town of Dorking, the historic White Horse Hotel has undergone a substantial refurbishment programme, and is due to re-open in November. London’s Whitechapel is about to have a hotel. Situated just behind the Royal London Hospital, and called New Road after the street where it is located, the property is a short walk from Whitechapel Station for the Elizabeth Line in the future and currently served by Overground, District and Hammersmith and City lines. Fare Lock is a new service from Wizz Air that will allow passengers to lock the fare selected for a specific flight with the bundle of their preference for 48 hours.